If you are like many others, you have an account on MySpace and lots of photos you have taken over the years and want to show to your online friends and fans. These can be the photos of your parties, graduation day, wedding, vacation and other exciting events. Of course, you can upload them to MySpace and show to others as they are, but you can also create a beautiful slideshow video and show your pictures in style. 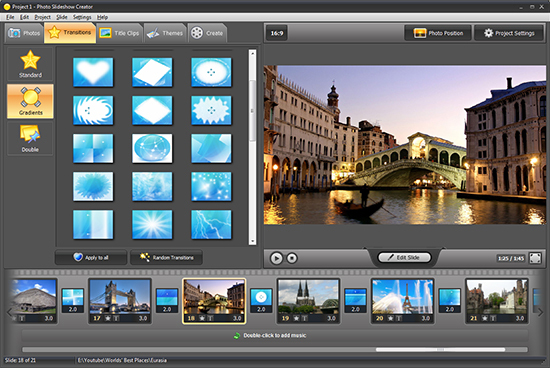 Photo slideshow software with its intuitive wizard-style interface, coupled with the library of prebuilt templates and skins let any amateur make a slideshow for MySpace with music in just a couple of minutes without any heavy-lifting! These are the basic guidelines on how to make a slideshow for MySpace with music. STEP ONE. First you need to install and run the software. You begin with your pictures that you select in the built-in file explorer and drop on the timeline to produce the slideshow. The program puts transition animations between the slides automatically as you add new pictures. However you can replace any one with your own selection from the transition library on the Transitions tab. For this, just drag and drop the transition between the slides. Once the photos are arranged, you can get a preview of the result in the preview player and make more edits if necessary. STEP TWO. Now you need to organize the slideshow with template slides and enhance the look using one of the prebuilt layouts that have been designed by professional designers. Template slides can help you make the start and end of the show more prominent and organize the story into parts if inserted between the photos. The software lets you edit their text, add your own and change the background fill to your liking. To give your creation a professional look, you can apply a theme that lets you embed the slideshow into a frame with a fancy design around. STEP THREE. Next step is to add music to the slideshow. On the menu bar, go PROJECT > MUSIC OPTIONS. This opens the dialog where you can add a music track (or multiple tracks) and sync music with the slideshow. Plus, here you can find options to enable the Fade In / Out effect, Shuffle, Replay music and Play music on start. As you can imagine, instead of music you can use your own voice to record comments about the pictures and add to the show. STEP FOUR. When you have prepared everything, saving the output is quick and easy. On the CREATE tab, select CREATE VIDEO SLIDESHOW > CREATE VIDEO FOR INTERNET > VIDEO FOR MYSPACE. As you do so, the program saves the video to disk. Now you can post the slideshow to MySpace and share your digital memories with your online friends. A professional slideshow with effects and layouts will make a greater impression than just a set of photos. This is how to make a slideshow for MySpace with music.